Harmony can automatically map Automatically maps drawings in an element to the mouth chart you have generated for a sound. This can save time when you are lip-synching a voice track. 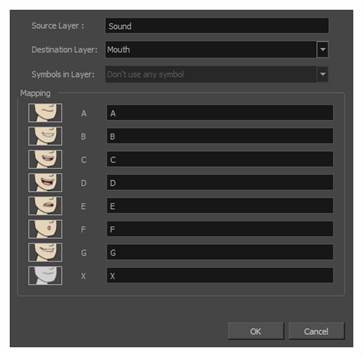 In the Layer Properties view, you can identify each lip drawing of a character. Harmony then automatically labels all of the cells in the character's element with the appropriate name. ‣ In the Layer Properties view, click on the Map button. ‣ In the Timeline view, right-click on any cell in the sound sample layer and select Lip-Sync > Map Lip-Sync. ‣ From the top menu, select Animation > Lip-Sync > Map Lip-Sync. The Lip-Sync Mapping dialog box opens.